Sport & Exercise Medicine is the backbone of the clinical services provided at The Allan McGavin Sport Medicine Clinic. Sport & Exercise Medicine focuses on the diagnosis and management of exercise-related injury or illness. This includes the all-important history, physical examination, and appropriate investigations in order to arrive at a working diagnosis. Prudent management entails activity modification, rehabilitation exercises, optimizing equipment/footwear, medications (as required) and braces/orthotics. 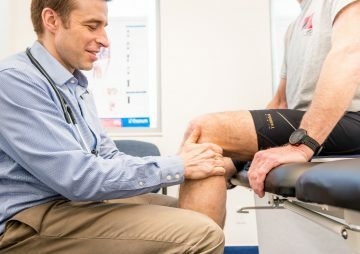 Our Primary Care Sport & Exercise Medicine physicians have all participated in a Sport & Exercise Medicine Fellowship program, and most have additional accreditation such as the Canadian Academy of Sport & Exercise Medicine (CASEM) exam or the SEM accreditation from the Canadian Royal College of Physicians and Surgeons. Many of our physicians manage the care of athletes on professional or elite national/provincial teams and several have worked at multiple “major games” including the Olympics, Commonwealth Games, BC Summer Games, and Canada games. A core group are involved in the day-to-day care of the UBC Thunderbirds – our varsity athletic teams. A referral from a Family Practice physician (GP) is required to receive an appointment with a Sport Medicine Physician.